Galway restaurants which to choose? Where to eat in Galway? Well, like most cities, there is a huge choice and being honest a huge variation in prices and standards. However, you will certainly eat well in any of the Galway Hotels listed seperately. But whether you are staying there or not,you will no doubt want to get out and about and sample something different. For a snack or light lunch you won’t go wrong with any of the Galway cafes mentioned, they are all very well priced and do fantastic home baking. I particularly like Goyas for paté and toast, Sam Baileys for soup and brown bread and Antons for a panini or wrap. 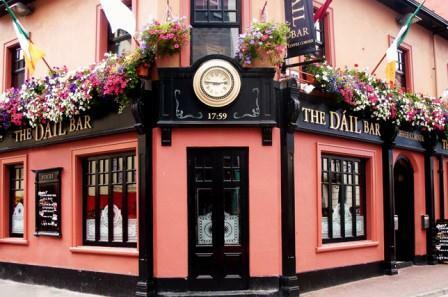 If you are on a budget the best tip is to have lunch in the middle of the day in one of the Galway Pubs . Most do a choice of main courses from 12-3pm for about €10, but if you would prefer to eat in the evenings, expect to pay a bit more. When your best bet is to wander down Quay Street where you will find Gemelles, Artisan and Ard Bia at the Spanish Arch, all are good value with innovative reasonably priced early-bird menus. If you continue over Wolfe Tone Bridge and turn right you and right again you will find yourself in Dominick Street which has an excellent selection of (better priced) restaurants including Oscars (magnificent ribs) and Cava, a very popular Spanish tapas style restaurant. Galway does ethnic pretty well with Kumars, also down by the Spanish Arch, an authentic Indian and Da Roberta's an excellent Italian out in Salthill. Da Tangs Noodle House, Middle St is a very good Chinese that only uses locally sourced organic ingredients. As for vegatarian options I am told that a new Japanese restaurant on New Dock St run by an Irishman and a Korean lady is the place to go for excellent sushi and homemade sauces. My personal favourite at the moment is the Asian Teahouse on Mary's Street which serves great big steaming bowls full of spicy Thai food and a glass of wine for €15. 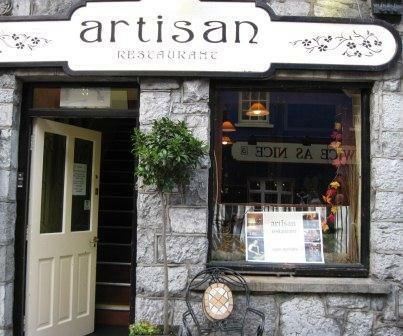 1	Artisan Quay St, nicely varied seasonal menus that utilises and supports our local food producers. 2	Asian Tea House 15 Mary St, love this place and they bend over backwards to be nice to you! 3	Cava Tapas Bar 51 Lower Dominic St, queues out the door of a saturday night so get there early. 4	Da Robertas 161 Upper Salthill, great Italian and with all of the Italian atmosphere and ambiance you'd expect. 5 Da Tangs Middle St, service is slow, as you would expect when everything is cooked freshly for you. 6	Gemelles 2 Quay St, nice intimate little restaurant, good food and atmosphere, perfect for couples. 7	Kumars Indian Spanish Arch, duck in through the stone arched door of this medieval building to sample some Eastern delights, try and nab the window seat. 8 Oscars Dominick St, the owner/chef is a photographer, the same artistic detail is obvious on the plate. 9	O’Gradys on the Pier Barna Pier, fantastic fish (and meat)restaurant, really special location and people. 10	White Gables Moycullen, wonderful sunday lunches although you have to book ages in advance its so popular! open tues- sundays at night, also.